The presentation took place in Ukrainian House in Kyiv 22.03.10, a few days after Lina Kostenko’s 80th birthday. 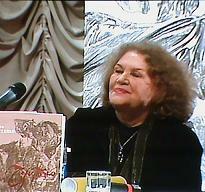 Lina Kostenko announced that she decided to return to literary and public activity after many years of silence. Photos and video were recorded from the screen in front of the over-crowded concert hall.